Beautiful Vacation Rental Home in Inlet Beach with Gulf Views! Enjoy complimentry beach set up! 2 chairs & 1 Umbrella! Located in the tranquil community of Heron at Inlet Beach, “Sanity By the Sea” is the perfect upscale beach house for a relaxing stay on the Emerald Coast. 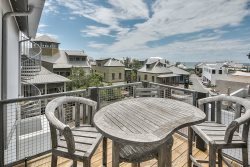 A short walk or bike ride to restaurants and shops of Rosemary Beach, less than 15 minutes to Pier Park shopping and entertainment, and within walking distance to the brand new 30 Avenue Shopping Center. Just minutes from the sugar white sand, this recently constructed house has an atmosphere of peace and relaxation that is noticed from the moment you enter the front door. Upon entering, you will find the living room and open concept kitchen. Featuring stainless steel, modern appliances, the kitchen and bar area are perfect for cooking and entertaining. Also on the first floor is a master king bedroom with full bath. A special feature of this house are the raindrop shower heads and spa-like feel of the gorgeously decorated bathrooms. There is also a SONOS music system throughout the house that will make your stay even more enjoyable. Moving up the stairs to the second level, you will find another king bedroom and a twin bunk room. The bunk room features two sets of bunks that are the perfect spot for children. Each room features large walk-in closets and is decorated with beautiful coastal décor that adds to the feeling of serenity that is so abundant throughout this property. On the third floor, you will find a third king bedroom with full bath. A feature of this floor is a home theater entertainment area with all of the latest entertainment equipment to watch your favorite movies and shows. The 65" ultra HD TV with 5.1 surround sound for a theater-like feel of the room. Another perfect spot for entertaining or relaxing after a long day at the beach! The adjoining balcony features Gulf views with ample seating for watching the gorgeous sunsets. It also has an outdoor grill, bar, and patio table that are perfect for cooking out. The SONOS system is also connected to the balcony, which adds to the laid-back vibe. Stay at “Sanity By the Sea” for the perfect stress-relieving vacation!